In the study, published in May in the Journal of Educational and Psychological Consultation by Nicole Alston-Abel and Virginia W. Berninger, parents were asked to rate their children’s ability to pay attention, set goals, control impulses and regulate their level of activity. Dr. Berninger, who is professor emerita of educational psychology at the University of Washington, said, “It’s not just the skills the parents teach at home, it’s also how they help their children’s self-regulation, sometimes called executive function.” Writing, she said, was just as important as reading, and the children in the study tended to struggle harder with writing, and to get more help with those assignments from their parents. Well over 20 years ago, when we started using books at pediatric checkups, we called it literacy promotion. Then for a while, “school readiness” was the buzzword and the byword, so, not unreasonably, we talked about school readiness. And as more and more attention was drawn to early brain development, it seemed clear, as we talked about getting books into children’s hands and children’s homes, that what we were really trying to do was help foster the language-rich parent-child interactions that build children’s brains. I still serve as national medical director of Reach Out and Read, a national program that works through pediatric primary care to encourage parents to read with their young children. We now reach 4.8 million children every year through more than 5,800 clinics and practices. We counsel parents about developmentally appropriate techniques for enjoying books with infants, toddlers and preschoolers, and we give out books at checkups through 5 years of age. When we discuss our program and our evidence, we talk about trying to support positive and responsive parenting, since young children learn best from back and forth. We also talk about “serve and return” interactions (child-adult-child-adult) and “dialogic reading” (asking questions, letting the child help tell the story), and we try to make it clear that reading with a 1-year-old or a 2-year-old is less about reciting all the words of a story and more about pointing and naming, question and answer, and of course, about the affection and the sense of security that will leave a child with positive associations with books and reading. The more we understand about the developing brain, the clearer it becomes that children need interaction; they are constantly learning, but they need adults and voices and interactions for that learning to take place. So the crucial advantage of a picture book may be that a baby or a toddler or a preschooler needs an adult to make that book “work,” to tell the story, produce the animal noises, make the pictures talk. 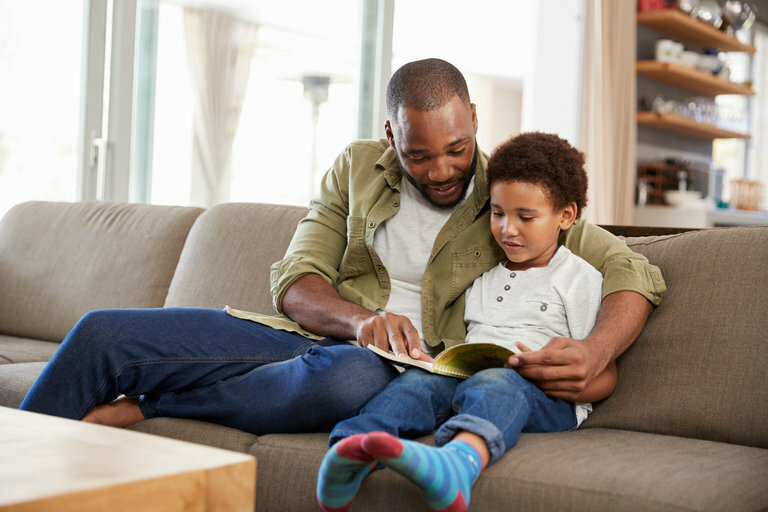 The child is using the adult to make the book talk and, at the same time, using the book to make the adult talk, that is, using the book to elicit the most desirable kind of attention, the kind that happens on a lap, with pictures and familiar stories. It’s wrong to think about literacy as just one restricted developmental zone, one arbitrary hurdle. In fact, literacy is about so much more than decoding print. When we talk about those early literacy skills, from vocabulary to book handling to dialogic reading, we are talking about critical brain development, about so much learning that can happen when all the pieces are in place before children get to school: a caring adult who is not laid low by other problems, not too distracted to pay attention, a household sufficiently organized to allow for routines, a “print-rich” environment in which there are appealing books available, suited to the child’s age, and a pattern established early of reading together for pleasure. And all of this continues to matter as children go to school and learn to read, and continue reading and writing activities in the home with parents. Reach Out and Read held focus groups, some years ago, for Spanish-speaking parents. We asked them to help us develop Spanish-language advice about the importance of reading aloud. The favorite messages were about love and affection: “el amor por los libros empieza en los brazos de los padres,” (the love of books begins in the parents’ arms). Read to your baby: “Es una muestra de amor!” (It’s a sign of love). The love of reading does begin in the parents’ arms, and it is a sign of love to read to your baby. And because it’s a sign of love, because it links books and written language to the parental affection and attention that babies are built to crave, and to elicit, it does help children acquire a range of early literacy skills. And continued attention by parents to reading and writing activities as children grow up and go to school seems to help them learn how to study and learn. For school-age children, Dr. Berninger said, “My advice to parents is foremost, enjoy your child and monitor whether your child is enjoying the literacy experience.” If a child is frustrated with — or just not interested in — the reading and writing activities at school, she suggested, reach out to the teacher, without suggesting that the teacher is to blame, and ask for some suggestions for joint activities. “Playing with language helps: riddles, jokes, word games like Scrabble,” she said. When we speak of literacy and literacy promotion, we need to acknowledge how much literacy encompasses. Yes, it’s a key to success in school, with all that implies about life trajectory, earning power and socioeconomic status. It’s also a key to citizenship and enfranchisement in society, to your ability to understand and take part in all the discourse that shapes your community and your country and your world. It’s the product of a whole range of brain circuits from vocabulary and vision and visual processing to memory and meaning. And when you take a very young child on your lap and point to the pictures and ask questions, when you make the animal sounds or recite “goodnight bears, goodnight chairs” one more time, you are making the kinds of direct connections that build young children’s brains and condition their minds and memories.